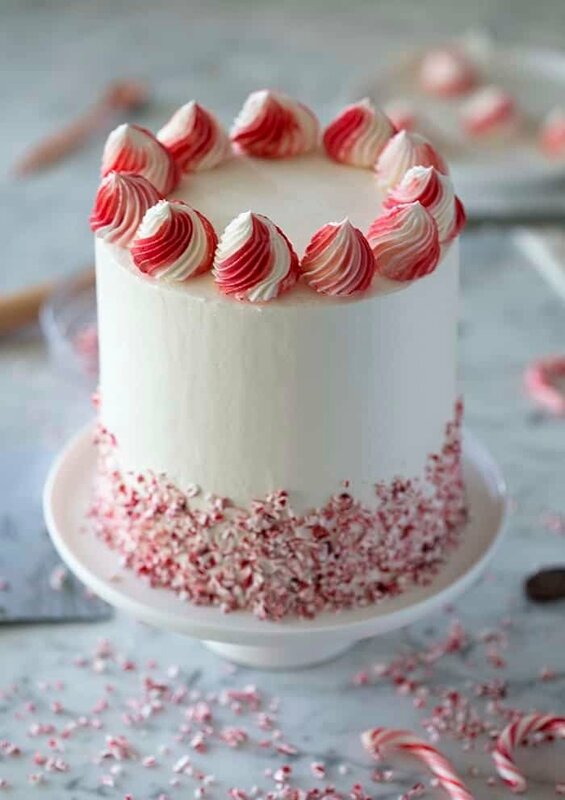 This rich, delicious chocolate cake is filled with a two tone peppermint buttercream, wrapped in silky Italian buttercream and skirted with crushed candy cane for a festive touch and added texture. 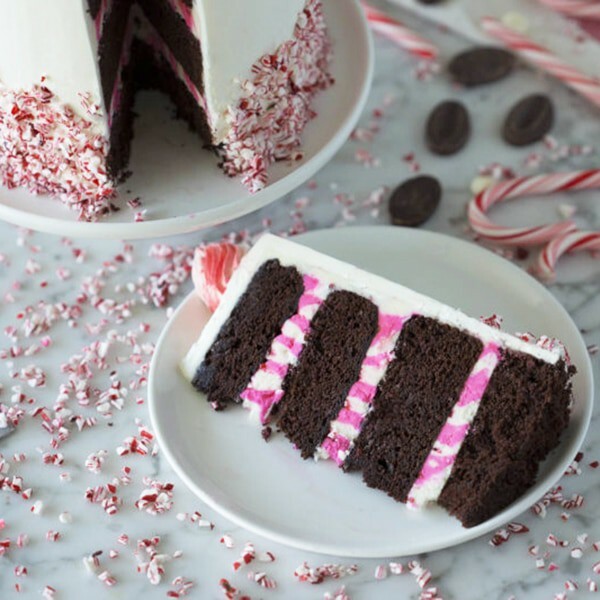 This dreamy chocolate cake is kissed with peppermint and white chocolate for an amazing holiday treat. On the outside a crown of red and white swirls and a skirt of crushed candy cane create a simple but elegant decoration scheme, while on the inside a two tone swirl awaits to delight your guests! Both Italian and Swiss meringue buttercream give you super smooth and VERY creamy frostings perfect for cake decorating! They are as a rule less sweet than American buttercream with is a plus for some and a munis for others. I have a FULL how to video and lots of tips in the blog posts for How to Make Italian Buttercream and How to Make Swiss Buttercream. Go ahead and check them out if you have any questions or just want a refresher! To pipe the two-tone frosting you fill one bag (1/2 way full) with white frosting, one bag with blue frosting and then put both bags in a third piping bag. No need for a tip, just snip about an inch off each bag. 1 Butter and flour 4 six inch cake pans. Preheat oven to 350F. Sift the flour baking soda and powder, salt and cocoa powder. 3. Beat the eggs and yolks in one at a time, then add in the vanilla and peppermint extract. In three batches, mix in the flour mixture alternating with the buttermilk. Don’t over-mix! Divide batter evenly into pans and bake at 350f for about 25 – 30 minutes or until the centers are done. Allow to cool in pans for about 10 minutes and then invert onto a wire rack. 4. For the Italian Buttercream, beat the egg whites, cream of tartar and 1/3 a cup of the sugar on medium high in a stand mixer. At the same time add 1 cup of the sugar and 1/3 cup water to a small sauce pan and cook on medium high. Stir to mix the sugar and water and then keep an eye on the temperature using a candy thermometer. When the sugar is at 240F and the egg whites reach the soft peak stage. 5. Slowly drizzle the sugar into the running mixer and lead the mixer running for 10 or so minutes to allow the meringue to cool. 6. Add in the butter a tablespoon at a time use immediately. 7. For the peppermint buttercream, Beat the butter and melted (and cooled) white chocolate together until well combined. Mix in the sifted powdered sugar and peppermint extract. Add the cream a tablespoon at a time until the desired consistency is reached. Separate into two batches. One will remain white and the other will be colored pink or red. Transfer each to a piping bag (fill half or a third full) with the tip snipped off and then add the two bags into a third bag fitted with a large round tip or with the tip snipped off. 8. Pipe the buttercream on the first cake layer. Sprinkle with crushed candy cane and repeat. 9. Cover in the assembled cake in a thin coat of buttercream. Smooth and transfer to fridge to chill. 10. Cover cake in Italian buttercream. Smooth sides with a bench scraper and top using an offset spatula. 11. 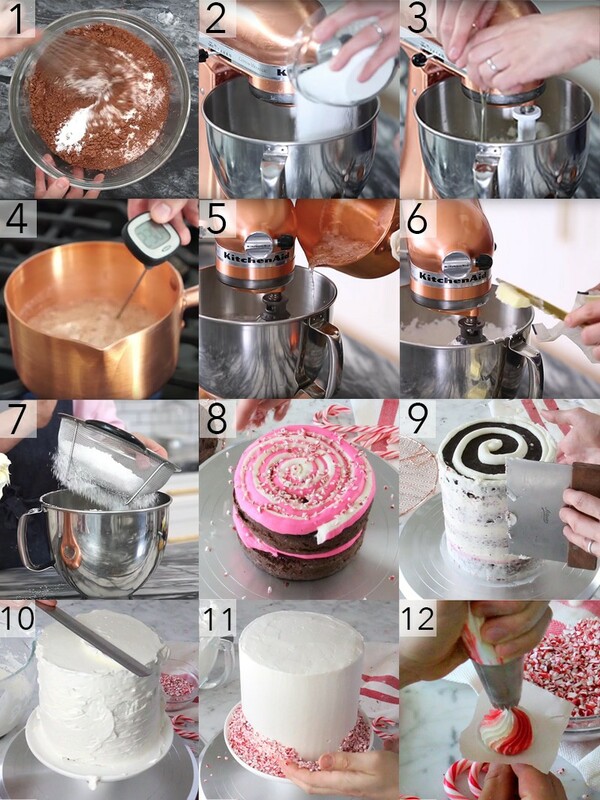 Press crushed candy cane onto the bottom third of the cake. 12. To pipe the two-tone dollops, apply red buttercream to two sides of a piping bag fitted with an 869 tip then fill with white buttercream. I piped the dollops separately onto a square of parchment paper then chilled the dollops and transferred to the cake. You can TOTALLY pipe directly on the cake but when I’m making a swirled dollop I like to have the option of discarding the imperfect one instead of trying to scrape them off the cake. 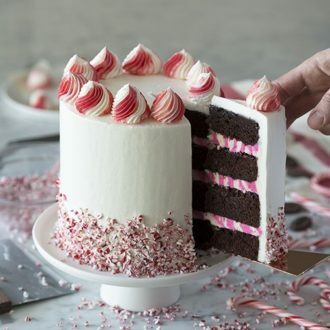 A rich chocolate peppermint cake with a kiss of peppermint, a white chocolate peppermint buttercream filling, crushed peppermint and a silky Italian buttercream all over. Butter and flour 4 six inch cake pans. Preheat oven to 350F. Sift the flour baking soda and powder, salt and cocoa powder. Cream the butter and sugar together until light and fluffy. Beat the eggs and yolks in one at a time, then add in the vanilla and peppermint extract. In three batches, mix in the flour mixture alternating with the buttermilk. Don't over-mix! Divide batter evenly into pans and bake at 350f for about 25 - 30 minutes or until the centers are done. Allow to cool in pans for about 10 minutes and then invert onto a wire rack. Beat the butter and melted (and cooled) chocolate together until well combined. Mix in the powdered sugar and peppermint extract. Add the cream a tablespoon at a time until the desired consistency is reached. Beat the egg whites, cream of tartar and 1/3 a cup of the sugar on medium high in a stand mixer. At the same time add the rest of the sugar and water to a small sauce pan and cook on medium high. Stir to mix the sugar and water and then keep an eye on the temperature using a candy thermometer. When the sugar is at 240F and the egg whites reach the soft peak stage, slowly drizzle the sugar into the running mixer and lead the mixer running for 10 or so minutes to allow the meringue to cool. Add in the butter a tablespoon at a time use immediately. Pipe the buttercream on the first cake layer (you can do a two tone swirl if you'd like 🙂 Sprinkle with crushed candy cane and repeat. Crumb coat the exterior and allow to set in the refrigerator for about 10 minutes. Add the Italian buttercream and smooth. Apply the crushed candy cane to the base. Using an 869 tip, pipe dollops onto the top. You can also pipe the dollops onto a piping nail, freeze and apply to the top once set. If you use the piping nail you can twirl it while you pipe to get a swirled dollop. I love this. I will be making it today. The only thing I have never made is Italian Buttercream. I’m scared, but I’m going to try. I can’t wait to make the filling. It sounds yummy. I wanted to make a new cake for Christmas this year and thought about peppermint because it’s pretty. lol No one seems thrilled when I mention it, but let’s see what they say after this. My husband will be the taste tester. He insists I make it today. Thank you for your recipes. I’m so glad I found you. Your work is awesome. what size cake pans are you using? Hi Chrissy — I use 4 six-inch cake pans. Thanks, John. Wow! Your work is quite impressive & inspiring! I used your recipe for the Italian Buttercream and it was great! However, mine didn’t come out as white as yours. Would you mind sharing what type of butter you use? Thanks so much and keep up the amazing work! Hi Vy — I use unsalted butter at room temperature. Hope that helps and thanks for all the support! Best, John. Beautiful. A work of art. But no matter what method I use I cannot get my outside so smooth. Suggestions? And how did you apply the peppermint pieces? Hi Cindy — If you are having difficulty, you can try doing a crumb coat first. I use an off-set spatula and a bench scraper to smooth it. I applied the peppermint with my hands (i.e. a scoop of it with my hands and pressed it against the cake). Let me know if this helps. Thanks, John. Do you think I should adjust the recipe for two 8-inch rounds? Or do you think it will work? The recipe measurements should work without adjustment! Hope you enjoy the cake! When you refer to creaming the peppermint buttercream. 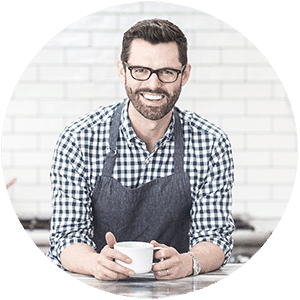 Are you talking about heavy whipping cream? Beat the butter, confectioners sugar and other ingredients for this step! Hope that helps! Enjoy! This was delicious! 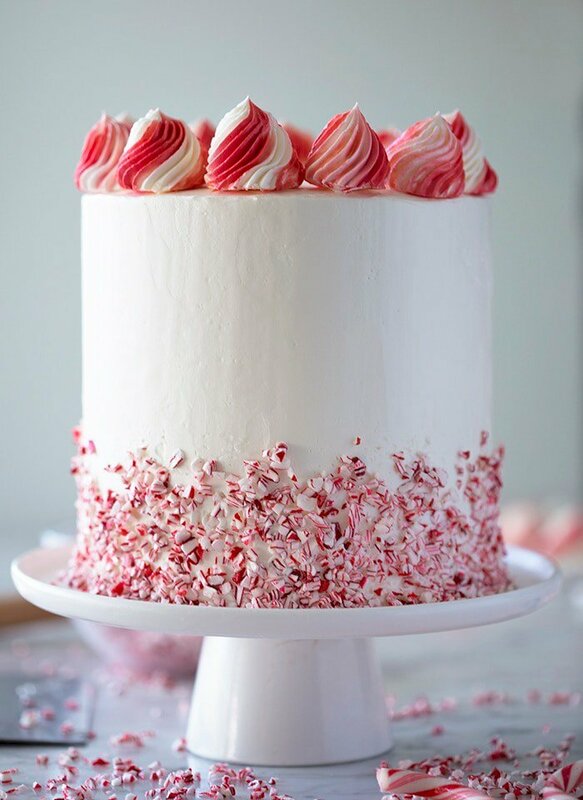 I baked it in a 9×13 for about 25 minutes or so, frosted it with the white chocolate peppermint buttercream and topped it with a little bit of crushed candy canes. I was worried at first the frosting was too sweet, but the cake really balanced it out. Thanks for a great holiday recipe! I will try this cake for the 18th birthday of my son. He loves pepermint icecreame and after eight. I hope I can get near your perfection! I hope your son enjoys the cake! I’m sure it will come out beautifully.